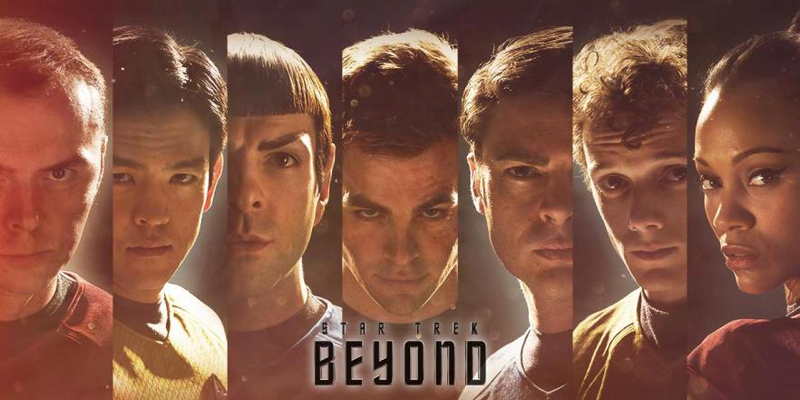 Check out the third action-packed trailer for Justin Lin’s Star Trek Beyond, featuring offers new footage and Rihanna’s latest single, Sledgehammer. After a team of scientists from an Earth that has never seen monsters opened a portal to a parallel dimension, they unleashed King Ghidorah on their own world. Godzilla Oblivion #4 sees the crisis escalate, having lured Godzilla from the apocalyptic parallel Earth to defeat King Ghidorah, they must now utilize a secret countermeasure against Godzilla – using replicated technology from the alternative Earth where monsters rule and the human race have made an alliance with Godzilla to protect them. As the fate of the world hangs in the balance, Godzilla’s rampage seems unstoppable, and the other Earth has a surprise of its own! The King of the Monsters goes up against an army of Mechagodzillas in Godzilla Oblivion #4, in the penultimate issue of IDW Publishing’s five-part comic series, written by Joshua Hale Fialkov and with art by Brian Churilla, the world shattering action continues as Godzilla faces the onslaught of the Mechagodzillas! With its innovative What If? twist on the Godzilla franchise, Joshua Hale Fialkov and Brian Churilla’s have crafted an exciting and action packed storyline. This issue brings events full circle as the cast of scientists and military characters observe the titanic face off between Godzilla and the Mechagodzillas. 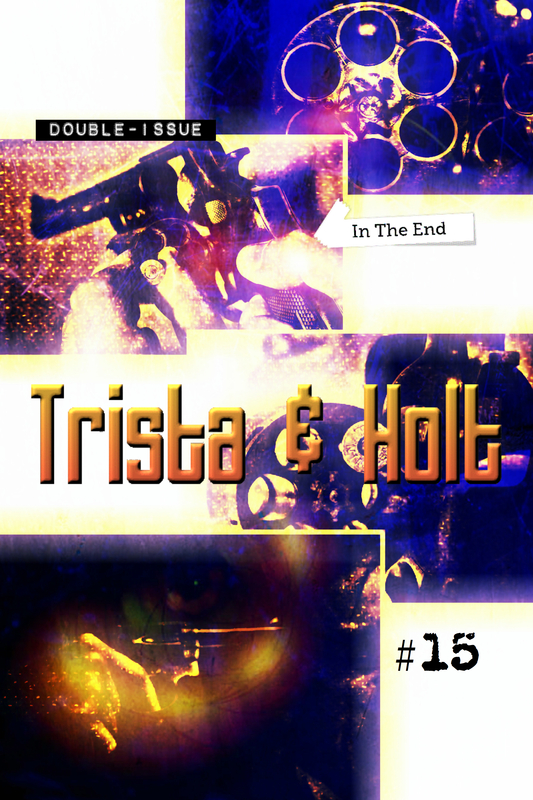 Joshua Hale Fialkov keeps the suspense building over the course of this action packed issue, especially when it becomes clear that the apocalypse these humans have unleashed on their Earth is far from over. However, when a further backup plan suddenly presents itself, it seems the defeat of King Ghidorah could have inadvertently provided them with one last chance to get Godzilla back through the portal! Brian Churilla’s artwork for this issue is excellent; indeed, it’s some of his finest work on this series so far. The opening battle royal between Godzilla and the Mechagodzilla army is stunningly realized by Churilla with bold page layouts and intense action, while the human characters observe the carnage and plan their next move. Their analysis of King Ghidorah is another highlight, where complex schematics and computer displays nicely complement the necessary exposition and techno-babble. The plan the scientist and military devise is audacious in the extreme, and its implementation is extremely dramatic. Jay Fotos’s vivid palette of colors also brings added clarity and definition to virtually every scene, employing a clever use of tone and shade which distinctly clarifies the human’s plight and also makes Godzilla look more powerful than ever before. The end result collectively makes Godzilla Oblivion #4 one of the best issue so far in IDW this mini-series. Everything, as you might have expected, builds towards a fittingly apocalyptic cliff-hanger of epic proportions. I think Joshua Hale Fialkov, Brian ChurillaIt, and Jay Fotos have really excelled themselves with Godzilla Oblivion #4, and it looks like we are in for one hell of a monster showdown for the final issue! The standout title from DC’s Rebirth event continues with Green Arrow #1, written by Benjamin Percy, featuring art and colors by Otto Schmidt, an exciting new era for the Emerald Archer begins. Together again following the events of the impressive Rebirth issue, Green Arrow and Black Canary have teamed-up once more to face a sinister new threat in Seattle that will challenge Oliver Queen like never before! Benjamin Percy and Otto Schmidt have certainly pulled out all the stops for Green Arrow #1, continuing directly from the events of Green Arrow Rebirth #1, where Green Arrow and Black Canary uncovered a secret cabal that had been preying on Seattle’s homeless and selling women and children on the black market to the highest bidder. 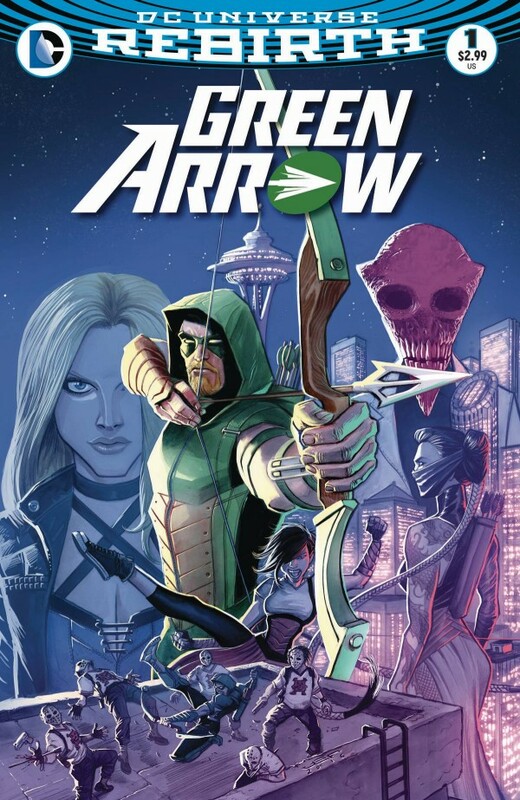 Green Arrow #1 opens on the fog strewn Seattle Docks where the mysterious Undergound Men are about to transport a consignment of victims in a shipping container. Green Arrow is ready to confront them, and determined to find out who is behind the human trafficking organization. While some might balk at the rapid pace with which Benjamin Percy builds up the house of cards in Oliver’s life, were, no matter how good Ollie’s intentions, Black Canary is quick to point out that chucking money at problems isn’t always quite the solution that he believes it to be, while also moving Oliver’s and Dinah’s relationship on significantly from the Rebirth issue, I actually found it refreshing to read a comic book that hit’s the ground running and just gets on with it for a change. 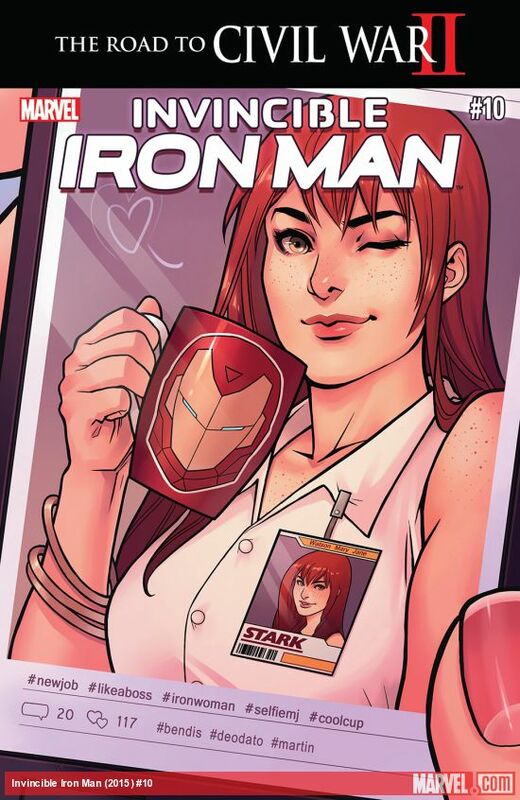 Sure, there are huge narrative leaps, and some of the dialogue seems a little clunky in paces, but it’s done with such style and finesse that the positives more than outweigh any of the negatives. I have to admit, its been a long while since I’ve read a Green Arrow comic regularly. I really enjoyed Green Arrow Rebirth #1 though, and I’m pleased to say that Green Arrow #1 also impressed me just as much, if not even more, than Green Arrow Rebirth #1 did. Benjamin Percy’s and Otto Schmidt’s take on the character and his supporting cast is brilliant, they’ve totally nailed it, successfully reaffirming the characters legacy and infusing culturally relevant issues into the mix to make Oliver question his own stance and role in the grand scheme of things. Then of course we have the sizzling chemistry between Green Arrow and Black Canary, together again at last in the DCU. Oh yeah, THIS is the Green Arrow comic that I’ve been waiting for! Green Arrow #1 gets the series off to a great start, this issue moves at a cracking pace, bursting with action, and emotion, it all builds to a jaw dropping cliff-hanger that will blow you away! Benjamin Percy and Otto Schmidt have crafted something very special indeed here, I’m overjoyed to see the Emerald Archer’s adventures being handled by such a terrific creative team, and can’t wait to see what else they have in store for Green Arrow in the months ahead! Godzilla, King of the Monsters thunders his way across the dimensional void to a another world as IDW Publishing’s new five-part comic series continues in Godzilla Oblivion #3, writer Joshua Hale Fialkov and artist Brian Churilla ramp up the monster action to the max, but will Godzilla’s arrival herald this Earth’s salvation, or its destruction? Joshua Hale Fialkov and Brian Churilla’s unique take on the Godzilla franchise with this innovative and exciting What If? Scenario, has already seen a team of scientists creating a portal to an apocalyptic parallel dimension, where monsters rule supreme and the rag-tad survivors of the human race have forged an alliance with Godzilla. Now, in a daring move, Godzilla has been transported to battle King Ghidorah on the scientists Earth in a desperate gamble that could soon backfire and threaten everything! 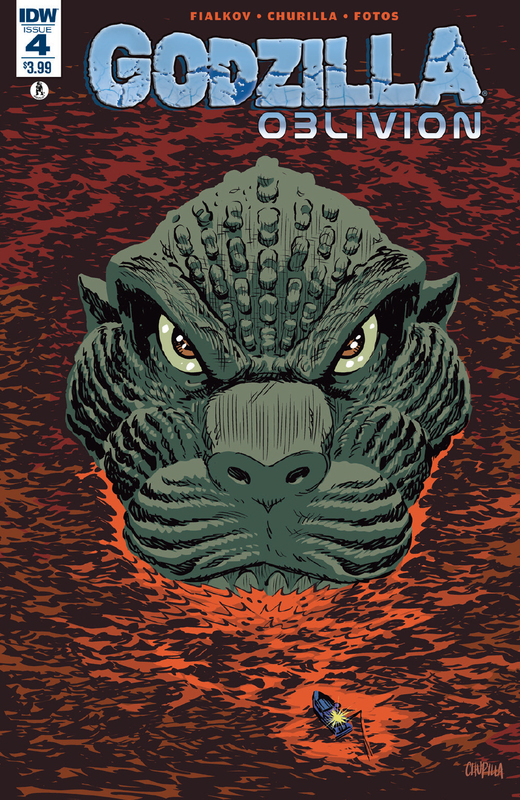 Godzilla Oblivion #3 is without doubt the most action packed instalment so far in IDW’s five part mini-series. 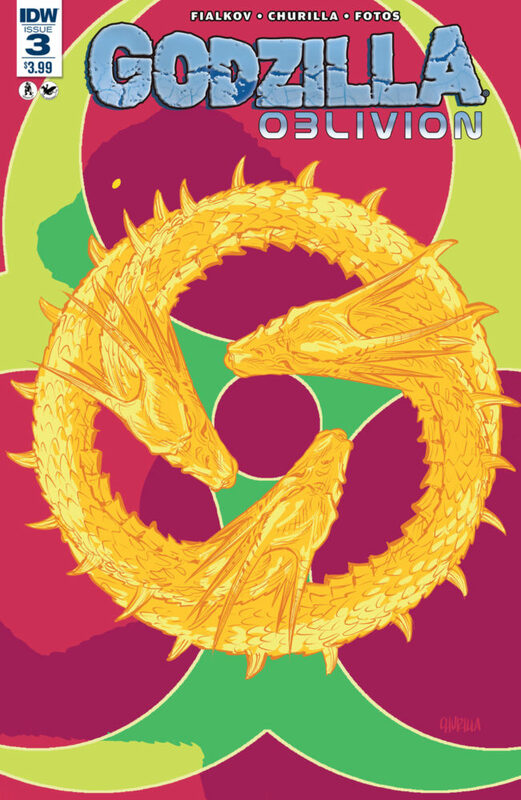 Joshua Hale Fialkov delivers a frenetically paced issue, with the battle between Godzilla and King Ghidorah taking center stage, while the scientists and military can only watch events unfold and wish for a hopeful outcome. The ethics and morality of both the scientist and the militaries actions are brought into sharp focus in this issue, Fialkoy channels the essence of just about every Godzilla movie trope you can possibly think of here, with the cast of characters watching and debating as the city levelling monster smack down between Godzilla and King Ghidorah escalates, and there’s plenty here for new and old school Godzilla fans to enjoy as the humans are ultimately forced to decide on a fateful course of action that could jeopardize the entire world! Brian Churilla’s great artwork on this series really comes into its own in this issue, every moment of Godzilla’s and King Ghidorah’s battle is gloriously realized across huge sweeping page layouts that really capture the epic scale of their conflict, and we even get more insight into the human cast amidst all the action. The humans naturally have a back up plan to fall back on, one were victory outweighs unacceptable losses, at any price. Churilla ensures the build up to this explosive moment will have you on the edge of your seat. The colors by Jay Fotos are also key to making this issue look so good, with a rich palette of tones and shades enhancing every moment of Godzilla’s and King Ghidorah’s momentous fight, and the delivery of the Thunder Lizard culminates in a haunting fusion of art and color caught in the glint of a monsters eye. This issue builds to a nail-biting close, with a seriously miffed Godzilla rising from the depths in spectacular fashion, and the humans of this world using replicated technology from the devastated parallel Earth to take the fight to Godzilla himself! Of course, with all the cover to cover action going on in Godzilla Oblivion #3, this issue is essentially one big fight sequence, albeit a spectacular one, and as a result it makes the issue a very quick read. However, if, like me, its full scale Godzilla monster smashing action that you‘re after, then Godzilla Oblivion #3 is just the ticket, with its fast paced story by Joshua Hale Fialkov and terrific art by Brian Churilla, this exciting IDW Godzilla comic series is really shaping up to be a gargantuan monster epic! This season’s major DC Comics event continues to unfold in Batman Rebirth #1, from Eisner Award winning Batman writer Scott Snyder and new Batman scribe Tom King, and featuring art by Mikel Janin, this special issue finds the Dark Knight detective facing a new challenge as of Calendar Man menaces Gotham City! Well, now that DC Universe Rebirth #1 has set the ball rolling, its time for the rest of the DCU titles to follow suit. Batman Rebirth #1 builds on the events of that landmark 80 page one-shot Rebirth issue, with a rejuvenated Bruce Wayne / Batman, who is also now restored to the peak of his mental and physical prowess. This issue marks another rebirth of sorts for DC’s main Batman title, with Tom King (Grayson, Omega Men) now taking over writing duties on Batman from Scott Snyder (Although Snyder does co-write this issue with King), and together they kick-start a whole new era for the Dark Knight detective. 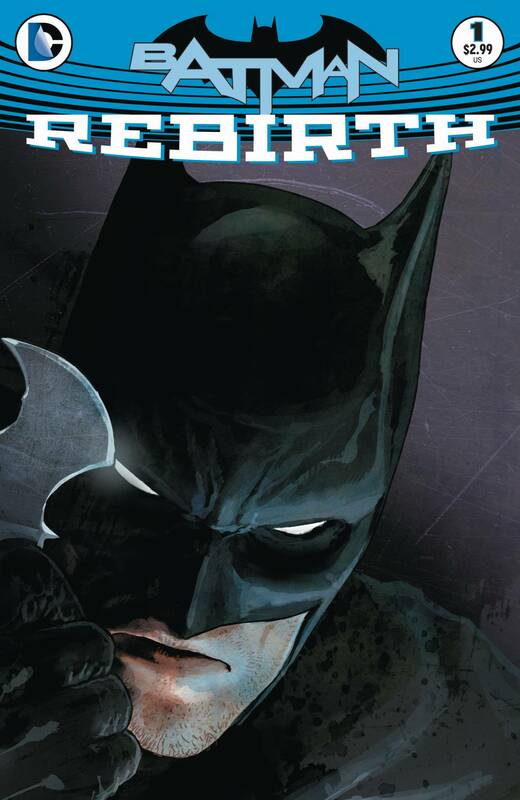 Batman Rebirth #1 throws us right into the thick of the action, the narrative unfolds across the accelerated seasons, with Batman dealing with a dire threat to Gotham, while Duke Thomas makes a major decision, and Lucius Fox has a poignant meeting with Bruce Wayne. 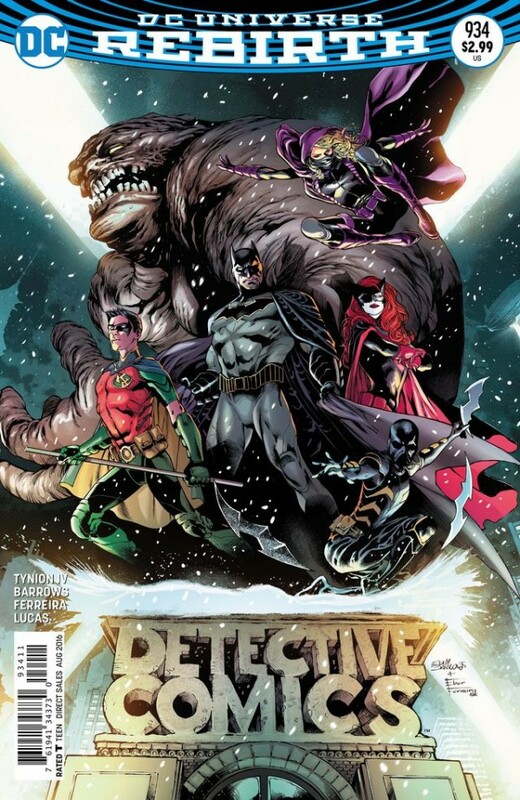 I like how the issue embraces the concept of Rebirth wholeheartedly to bring a us fresh perspective to many of the established elements in the Bat-Books, there’s almost a sense of passing the baton so to speak, as we begin to move on from Scott Snyder and Greg Capullo’s run and Tom King starts to bring his vision for the character into sharper focus. 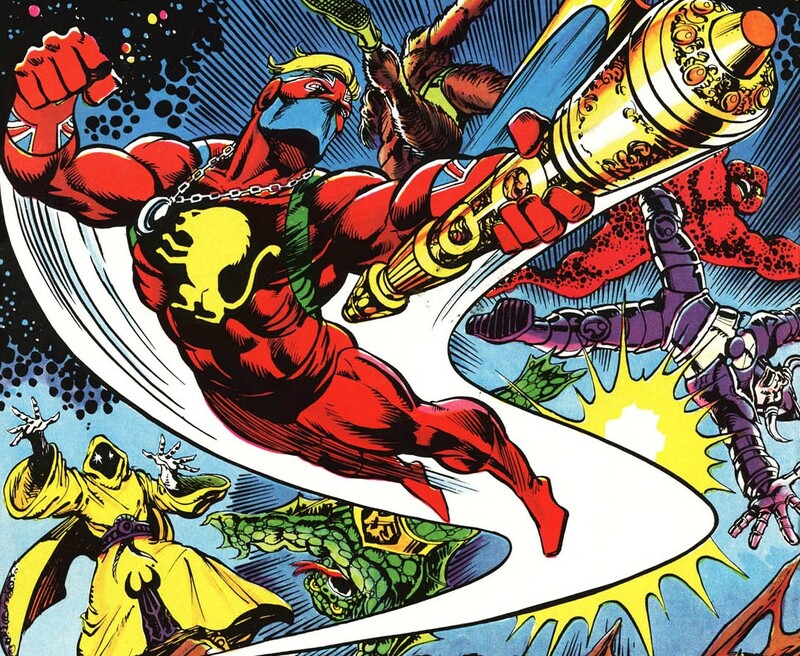 The story meanders in a timey-wimey fashion somewhat, but that’s probably to be expected when the main antagonist in this issue Calendar Man. Calendar Man might seem a like strange choice of villain for this Rebirth issue, especially as he’s not exactly from the higher echelons of Batman’s rogue gallery, but he actually turns out to be a perfectly fitting choice for this story and Batman Rebirth overall, and his scheme here presents Batman with a major challenge. This version of the Calendar Man arguably takes the seasonal themes on which his crimes are always based to a whole new level, it was something I wasn’t expecting, and the character gets a much needed overhaul that effectively sees Calendar Man reborn in the most unique and unsettling way over the course of the story as well. With its striking cover and impressive artwork by Mikel Janin, and fine colors by June Chung, Batman Rebirth #1 is certainly an eye-catching issue. There are some truly stunning set-pieces, especially those involving Batman’s confrontation with Calendar Man, a vertigo inducing work out, some intense underwater action, and Duke’s inauguration into Batman’s world continues to offer up something entirely new and unexpected. Seriously, the Bat-Cave looks stunning in this issue, the scene with Lucius Fox is also especially moving, and there’s a terrific bond that’s developing between Bruce and Duke as well that is sure to bring a whole new dynamic to the Dark Knights world. Batman Rebirth #1 is an action-packed, emotional, and thoughtful issue. We now begin to get a greater sense of how DC Rebirth will resonate through the legacies of all the major DC characters, and if the rest of the Rebirth issues are half as good as this, the DCU is well on the way to reinvigorating their characters in fine style. In short, I’d recommend Batman Rebirth #1, and I’m really looking forward to what Tom King and David Finch have in store for the Dark Knight even more now. Featuring a solid storyline, powerful and emotional scenes, a new role for Duke Thomas, and Calendar Man’s stomach churning – sure to make you recall a certain forth season X-Files episode – rejuvenation, Batman Rebirth #1 heralds a promising new chapter for the Dark Knight. One thing’s for sure though, no matter what the future might hold, the word can’t is still something that will never, ever exist in Batman’s vocabulary!